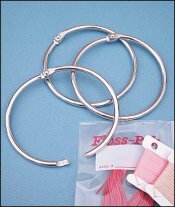 3 Metal Rings, Pack of 10 for Floss Organizers  - $9.00 : Yarn Tree, Your wholesale source for cross stitch supplies. 3" Metal Split Rings, 10 Rings per Pack. Large 3” split rings to hold Floss Paks, Floss Keys, and other brands of thread organizers. Nickel plated steel. Unpackaged. Order by the pack.